My love for the Instant Pot grows with each use! 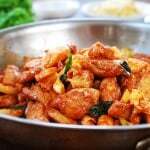 I’ve been making this classic Korean chicken dish, called dakbokkeumtang (닭볶음탕) or dakdoritang (닭도리탕), using the Pressure Cooker function of the Instant Pot. I love how quick this juicy, flavorful dish is! 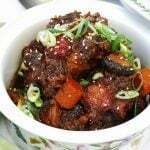 If you’ve tried my original dakdoritang recipe, it takes 3 to 4 hours of cooking time in the slow cooker, or 45 minutes over the stove top. With this Instant Pot recipe, a few minutes to sear, a few minutes for pressure to build up, and 10 minutes to pressure cook! That’s it! The flavor of this Instant Pot adaptation is very similar to the original recipe — spicy, savory, and slightly sweet! 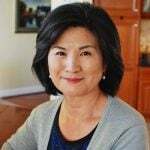 However, I’ve made a few minor changes for this recipe, adding some doenjang (Korean fermented soybean paste) and oyster sauce, which are packed with intense savory flavors. 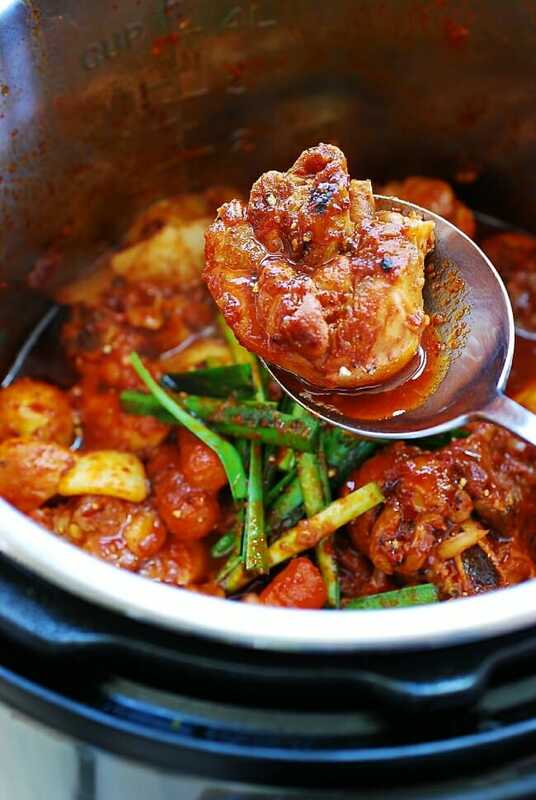 Dakbokkeumtang is made with small, bone-in chicken pieces. 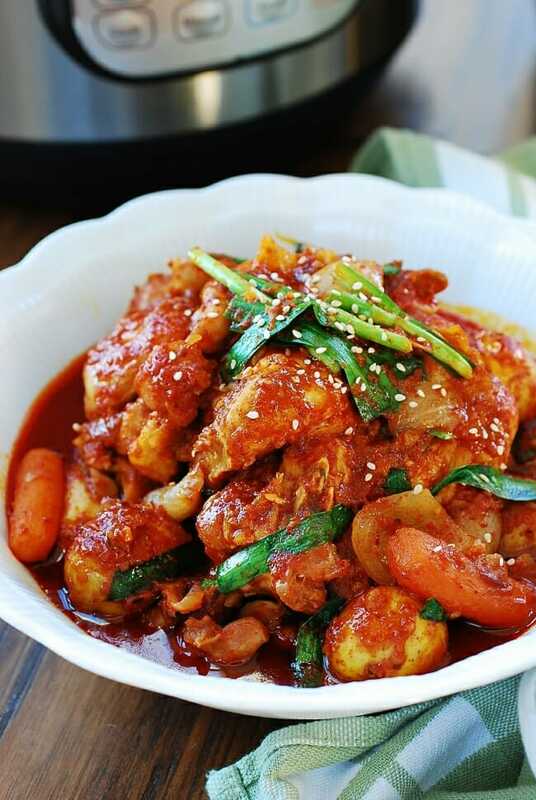 Since this dish is very commonly made at home, you can buy a whole chicken pre-cut for this dish at markets in Korea. Korean markets around here also sell small chicken pieces which are labeled for dakbokkeumtang or dakdoritang, but they are large drumsticks cut in half crosswise. I used them in this post. Wings, small drumsticks, and thighs are all good choices. If the chicken parts are big and you don’t want to bother cutting them in half through the bones, make a couple of slits on the thick parts of the meat for the sauce to penetrate well. 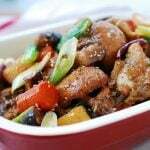 Can I use boneless and/or skinless chicken parts? 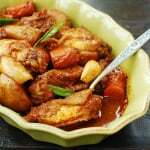 Although not the best option, you can certainly use boneless and/or skinless chicken. If using boneless, reduce the cooking time by a couple of minutes. Do I need to add water to this recipe? The sauce (which includes 1/4 cup water or broth) and other ingredients in this recipe yield sufficient liquid for pressure cooking, leaving a good amount of sauce at the end. 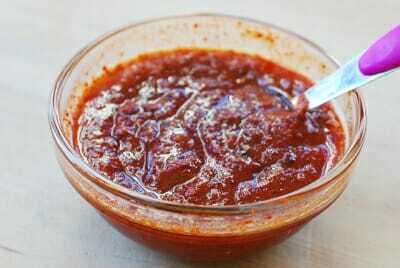 The sauce is delicious mixed in with steamed rice. 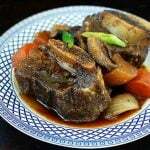 Can I cook this recipe in a slow cooker or over the stove top? Yes, you can. 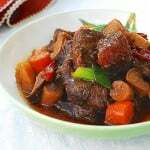 Simply omit 1/4 cup water (or broth) from the sauce recipe and follow the applicable cooking methods in my original dakdoritang post which provides both slow cooker and stove top methods. What do I need to adjust if I want to use a stove-top pressure cooker? You can sear the chicken in a skillet before adding to your pressure cooker. Also, stovetop pressure cookers have a higher pressure point. You will need to reduce the cooking time slightly depending on your pressure cooker. Will this sauce be good for braising other types of meat? The sauce will be great with any meat of your choice. 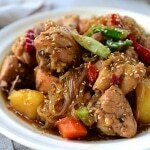 Classic Korean chicken dish that’s adapted for the pressure cooker! You’ll love how quick this juicy, flavorful dish is. 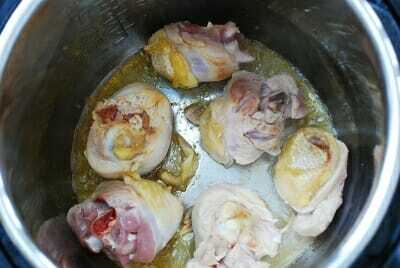 Combine the sauce ingredients except sesame oil and seeds, and mix well. 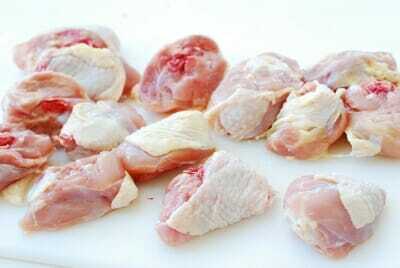 Rinse the chicken pieces, drain, and pat dry with paper towels. Press the “Saute” button on the Instant Pot. When the pot is hot, add 1 tablespoon of canola or vegetable oil. Sear the pieces in two batches. Place all the chicken pieces in the pot, and add the potatoes, onion, and carrots. Pour the sauce over, and mix well to evenly coat the chicken and vegetables. Close the lid tightly, and seal the vent. Press the “poultry” function, and using the “+” or “-” button, adjust the time to 10 minutes. When finished, the Instant Pot will automatically turn to the “Keep Warm” mode. Turn the pressure valve to “venting” to quickly release the pressure. Open the lid. Stir in the scallion (or garlic chives) and the sesame oil and sesame seeds. If you want, remove the meat and vegetables from the pressure cooker, turn the Instant Pot Saute function back on, and reduce the sauce to the desired level with the lid open. 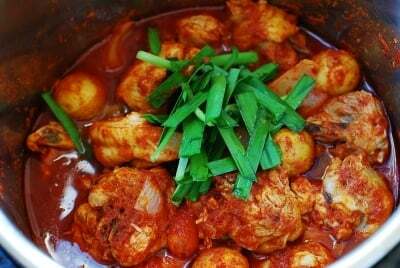 Can I still make this dish if my family doesn’t eat spicy food? What ingredient would I leave out? Thanks! 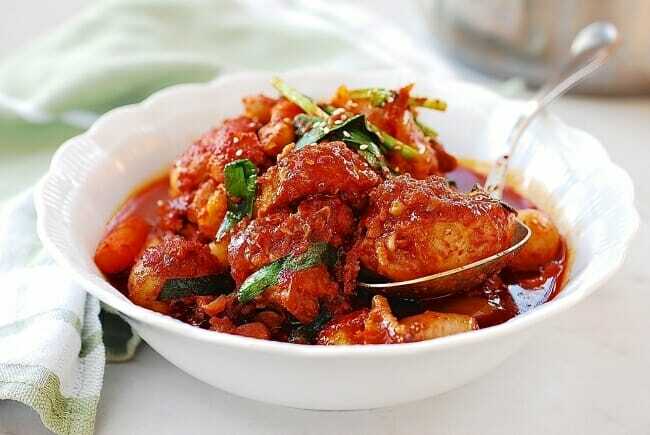 the sauce has definitely given the chicken pieces good colour that makes the dish attractive to the eyes,for me I would add a little bit of spices to make the dish interesting. I’ve attempted this recipe twice and each time the gochugaru sticks to the bottom and burns, making my instant pot unable to build up enough pressure. how did you get it to work with this recipe? hmmm that’s interesting! I make this recipe all the time and never had that problem. Did you use all the sauce ingredients? Did you use all the vegetables in the recipe? You should have plenty of liquid to generate the steam as you can see all the liquid still remaining in the final step photo. yup, all the ingredients. maybe it has to do with the kind of gochugaru i have. it’s very coarse. maybe there is a finer powder i can buy that will suspend in the liquid, as opposed to drop down to the bottom and burn. Try to put the onion at bottom of the pot. 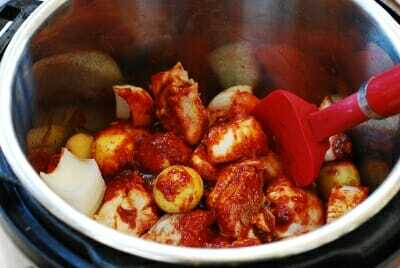 The onion will protect the sauce building up at the bottom and will produce enough moisture not to burn the pot. Is this recipe very spicy? If yes, can I just put in 1 tablespoon of gochugaru? Hi Angie – Yes it’s quite spicy. You can certainly reduce gochugaru to 1 tablespoon. Hope you try it! I tried this recipe and it was great, thank you for sharing! It’s so fast in the Instant Pot and the potatoes and carrots had the perfect texture with the time cooked. I saw other recipes that called for less sugar so wondering how different it would tast with less. You’re welcome! And thank you! Try with less sugar. It’s all about personal preference. 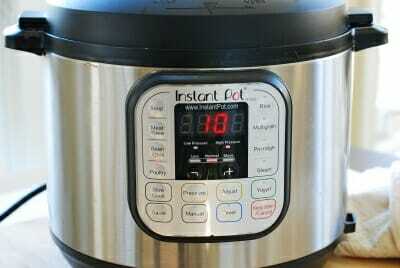 What size of instant pot do you use? I got the burn message and wondered if I should increase the liquid (1.5-2 cupsminimal for 8qt pot per the manual). I’ve tried the slower cooker version and it was VERY tasty. I certainly hope this could work in the IP (and many other recipes) as it saves time. Thank you for all the great recipes! My pleasure! Mine is 6 qt. Used less gochugaru (chili flakes) and added more carrots and potatoes. This is such an easy recipe! Spicy and yummy food too! Thank you! I used my 3qt instant pot duo and used manual high pressure mode for 10 minutes. It worked out well. Great to know! Thank you for the great review!!! Hi Hyosun, a quick question on the 1/4 cup of water/broth — does this go in the sauce mixture? I wasn’t sure. Thank you! Can’t wait to try this. Yes. It just needs a little more liquid than what the seasoning ingredients produce for pressure cooking. Great recipe. I’ve made this a few times now and I’ve made some adjustments for larger quantities in the instant pot. I regularly double the amount of meat and marinade for 5-6lbs and use just chicken drumsticks. I saute in heavy pan instead of instant pot while veggies are cooking and recombine everything in this at the end. I double the garlic, reduce the sugar by half to 1tbs to taste, and only add sesame oil and seeds at the end if necessary as stew can be oily from the chicken. Gochugaru quality varies so I use half fancy spicy rough and half plain powder gochugaru,reduce by 1 TBS or more if too spicy. I first pressure cook 2 chopped carrots and 5 quartered potato for 5 minutes in steamer basket. Remove the water, adding about half cup to the marinade paste if it’s too thick to coat chicken. Pressure cook chicken for 22 minutes, natural release 4 minutes. 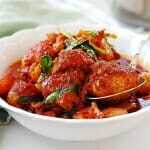 Combine chicken and sauce with vegetables. Optional light stir fry the veggies with some chopped Korean long hot peppers to keep them warm while chicken is cooking. Thanks! Sounds like you are a great cook, Chris! Also I’ve found that this recipe tends to result in the Instant Pot saying “burn” – anyone else have this problem? I usually add 1/2 cup of water instead of 1/4 cup and this happens less often. Thanks for posting this recipe! It’s great!